An initiative by Avsar Parivar, Swar Kalrav is an inter-school Gujarati singing completion for the students of schools in Maninagar. Students can participate in 3 categories; up to 3rd Standard, 4th to 7th Standard, 8th to 12th Standard. 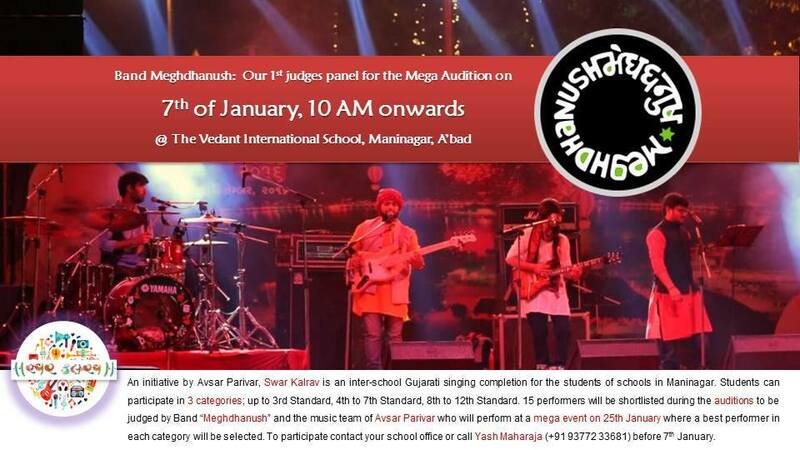 15 performers will be shortlisted during the auditions to be judged by Band “Meghdhanush” and the music team of Avsar Parivar who will perform at a mega event on 25th January where a best performer in each category will be selected. To participate contact your school office or call Yash Maharaja (+91 93772 33681) before 7th January.